Have you ever struggled with journaling, or are running out of inspiration on how to journal? I’ve been there. 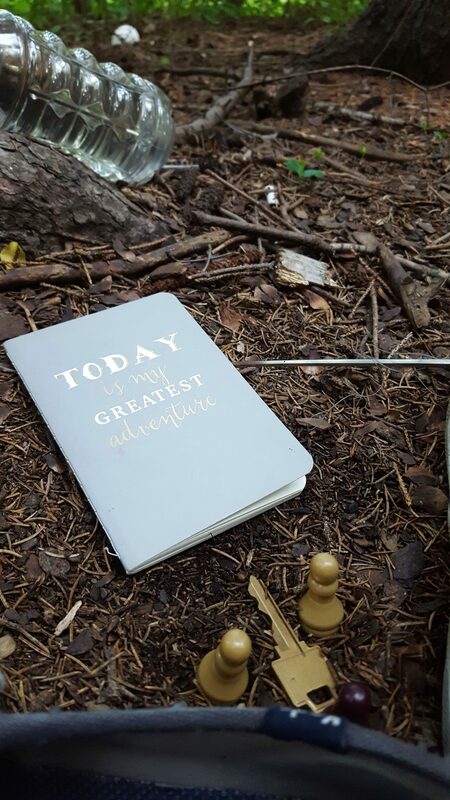 There are so many different types of journaling out there when I did research but I’ve only done one: the one where you rehash your day and how you feel. Wait–delete that thought. I lied. I’ve done another one before for gratitude. That’s when I list 3 things I’m grateful for each and every single day and 3 things I’ve achieved at the end of the day. While listening to podcasts on my phone one day, I came across Stream of Consciousness. It’s when you mind-dump on pen and paper every single thought you have at that particular moment. SOC journaling is done fast, without pauses or breaks in between unless you have a hand-cramp because naturally, your hand won’t be able to keep up with the thoughts that jump into your mind. Often you’ll have run on sentences and paragraphs that make NO SENSE and run incohesively. That is totally natural! Here’s more details on how to do it if you’re confused, but honestly, it’s not rocket science; just get out pen and paper and continuously write and write and write for 3 minutes. I suggest you set up a timer. Stream ~ of Consciousness writing = Never stop writing. and humidity is about 75% so I didn’t run this morning. I can start sleeping in until 9:20 am these days because the workshop for the musical theatre downtown has finally ended. The only early morning class I have are Monday @ 8:30 am with Peter. Oh it’s time to go now! As you can see, totally unedited and raw and just…weird? Haha. 🙂 So why don’t you give it a try? I gotta tell you something new in my life. I’m gonna be honest–I had the urge to use this as an eating bowl for my bigass salads. 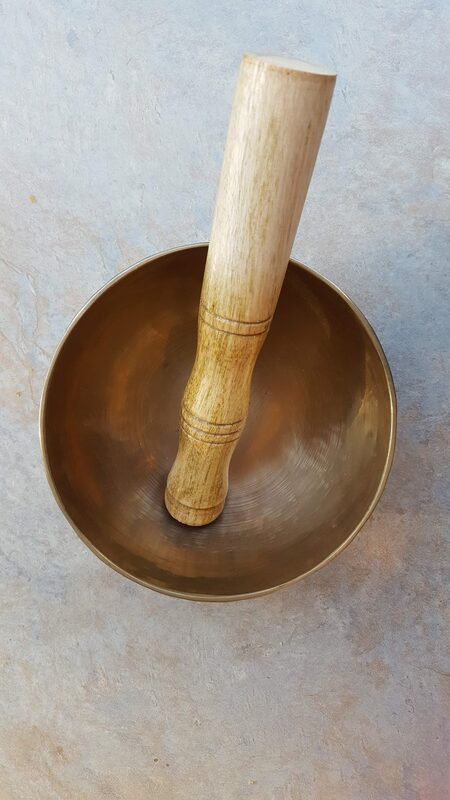 Singing bowls have incredible healing effects and are widely recommended by health practitioners. 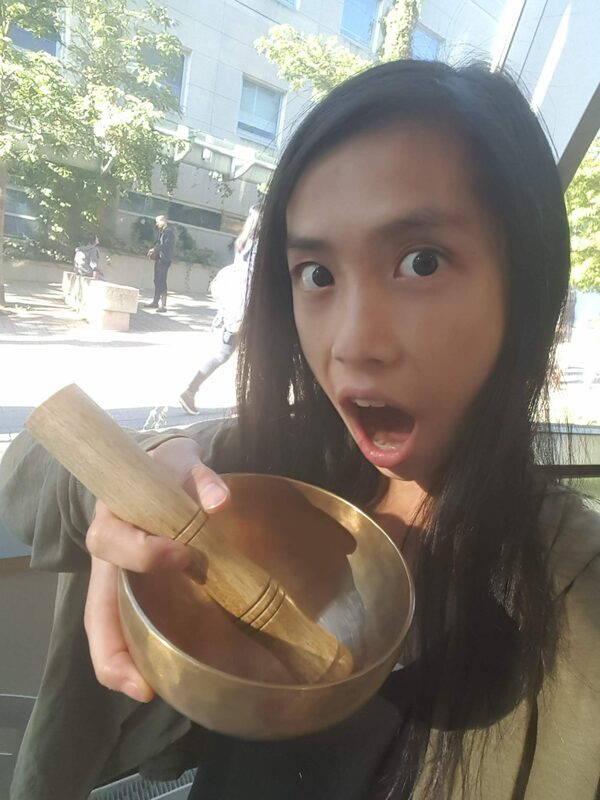 The vibrations created by a singing bowl benefit the body by reducing stress, positively affecting the nervous and immune systems, inhibiting pain, combating depression, and balancing the chakras. In Ayuvedic medicine, illness is caused by disharmony within the body. Because matter is energy that vibrates at different rates, the structure of matter can be changed by altering the rate of vibration. The body and mind are healthy when they vibrate in harmony. When you play a singing bowl, the vibration cause the right and left side of your brain to synchronize and emit alpha and theta brain waves in synchronicity with the vibrations emanating from your singing bowl. Theta brainwaves are essential to healing the body and mind and create an experience commonly known as “being in the zone”. This synchronization brings your body and mind into harmony and helps you enter deep meditate status, receive intuitive messages, and engage in creative thinking. I tried out the singing bowl (which I’ve decided to name Shanti after the name Shantibowl; I have a knack for naming little things like my aroma diffuser Ooh, my frother Fred, and basil plant Bae) one night when I felt anxious. You know that feeling when your mind can’t quiet down, and you’re on the lookout for danger but you can’t see any? That’s what was going on for me. I had impending projects to finish that weren’t urgent, but I did feel like the day was running me rather than the other way around–me running the day. I felt like the entire day I was on the treadmill at a speed that left me at the last quarter of the belt, nearing the edge of falling off. And the thing was, I didn’t even complete what I wanted. I had spent the day wasting time running errands that didn’t get complete. Oh, I hate that–feeling like ick. I don’t like the words, “wasting time“, either, but when we come down to the essence of it, nothing is a waste of time in our human existence. We are souls, having an experience on earth. Nothing is inherently good or bad; we just subjectively place them so. Anyway, I struck this little bowl on the side with the stick and let the sound resound in my room. Somehow, I started to breathe deeper. I struck it again, out of desperation and frustration for the tornado that was my mind. The more I struck it, the more “in the zone” I got. I started to hear a singing that I haven’t heard before–it was an octave higher than the main gong. I chanted, “Ek on Kar sat gur prasad”, which is something I chant whenever I feel negative energy creep up over my shoulder. I’ve learnt it from Spiritual Junkie Gabrielle Bernstein. I sang. I sounded out vowels, “A”, “E” “I” “O” “U” and lingered on the “O”–dragged it out until I got a bit teary. After about 5 minutes, I felt more at peace. Do you own a meditation bowl? What Zen products do you use? Your challenge: Try it first thing in the morning and last thing at night! This entry was posted in Fitness, Health & Mindset, Reviews & Giveaways, Uncategorized and tagged anxiety, journaling, meditation, singing bowl, spirituality, therapy, Zen.